Making connections is a critical part of the school experience; it is what many of us remember about our own schooling. Relationships, the friends we make and the connections we establish together underpin much of the learning we engage with. We learn to work together, learn from each other’s experience and over time, develop an appreciation for diversity and how much stronger we are when we collaborate. For upwards of four thousand of students in Victoria each year, studying at the Distance Education Centre Victoria means working from home or in a library, taking subjects online to complete their schooling. Whether it is for a short time, or an extended period, increasing numbers of students each year either choose or find themselves placed in a position where a distance education program suits best. In the past,correspondence school attendance necessarily meant that these types of relational connections took a back seat. What distance education looks like now in this country is however markedly different and what differentiates many distance schooling and traditional classroom experiences has also become increasingly difficult to define. As digital communication tools have rapidly developed, the possibility of establishing the rich and authentic classroom relationships ha sbecome a reality. Teachers and students, and students and their peers are able to teach and learn together online in increasingly sophisticated ways. Some barriers however,have always been more difficult to break down, particularly in a subject area such as Drama where embodied communication plays a key role. In a partnership established between the Distance Education Centre Victoria and Melbourne Theatre Company in 2017 this idea has been explored in a program called ‘In and Out of Worlds. 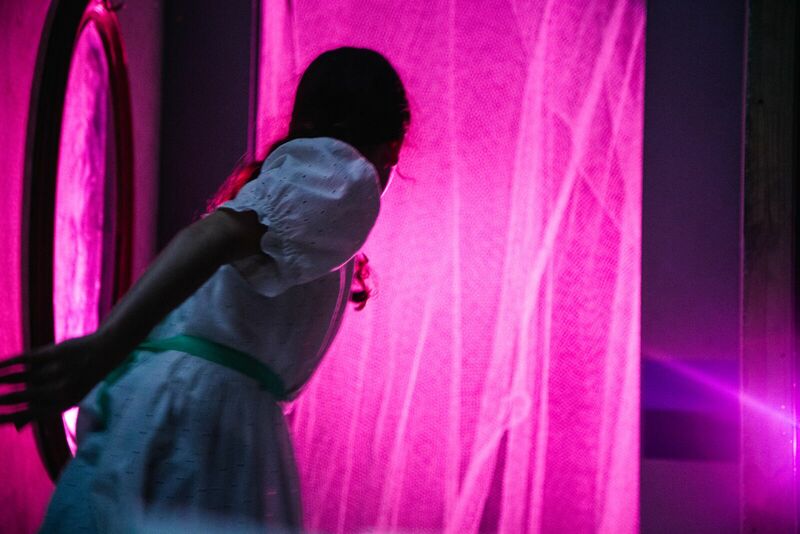 Through this partnership opportunity, created by the Creative Victoria Education and Partnerships funding program, we have explored new ways to navigate meaningful connections between students learning at home, and those physically attending subjects like drama. Now in its second year,the DECV continued to explore the pedagogy of teaching to dual audiences,working to build connections between students attending workshops in person and those attending virtually from home. We do not simply want these students to participate in activities together, we have instead worked hard over the lasttwo years to provide them with opportunities to develop empathy and a real connection with their peers. A natural inclination when teaching to two audiences where one is physically present, and the other is attending virtually, is to direct your attention to those students in the room,as these are the ones you receive an embodied response from. When students in the room smile, you gain immediate feedback! Assessing the engagement of a nonline audience under these conditions is far more challenging. Unless you focus very directly on their experience, inviting perspectives and gauging responses, continually testing the water, their experience very quickly becomes one in which they are simply along for the ride, not participants but observers. Students participating in the program take part in forums and online classroom spaces between workshops ove rthe course of the semester, conducting some of their collaborative effort in synchronous and asynchronous spaces. When they attended workshops, an MTC artist and DECV Drama teachers work with students in the room and those attending virtually as a group. The students attending from home have a teacher in the room as their proxy, roaming the space with an online classroom, projecting the space to those at home, asking questions ontheir behalf. Large projections of the online discussions of those at home are displayed on the walls to allow students in the room to keep abreast of the topics under discussion. Students attending from home ‘see’ through the eyes of the roaming camera, putting forward ideas and participating in activities, engaging in a collaboration with those in physically present in the space. The students taking part virtually take part in discussions, prompt peers for clarity, provide directorial advice and gradually, get to know the other students in their class. As much as possible, our intention has been to make them feel involved and connected to discussions and activity in the room. The students physically attending the workshop are constantly aware of their online peers, and very quickly take the initiative to ensure they are not simply included, but a necessary part of the activities. Over the course of both the 2017 program and the 2018 program we have also noted a remarkable thing happening. Students that had not previously attended in person, begin to show up at workshops. While virtual attendance is stimulating and engaging for many,and a number attend exclusively this way, in a number of cases Virtual Attendance appears to be the hook go draw them into physically participating. At the end of 2017 and again in 2018, the culmination of the drama program is a performance and installation of work at the MTC headquarters attended by staff and parents. Some students participate on stage, some attend virtually, and some students and their work are represented through live and recorded video and audio installations. An additional outcome of the partnership, has been the development of a Professional Development course, now available to 180 DECV teachers, based on the research conducted over the course of the two-year partnership. The new classroom streaming techniques first piloted in an Arts subject in 2017 have now been employed in a range of other learning areas in 2018, including in Biology and Chemistry practicals,Psychology field trips and English seminar discussions. With another semester collaborating with the MTC behind us, DECV teachers are already looking forward to another year of strengthening our partnership, and further exploring all that is possible in this space.